Broil 8 to 10 minutes, turning steak and stirring vegetables once, until instant-read thermometer inserted in thickest part of steak reads 135°F (for medium). Transfer steak to cutting board; cover with foil, and let steak rest 5 minutes. If your oven’s broiler only covers the center of your oven, start steak in the center of the pan, then thoroughly stir vegetables and position them in center while steak rests to ensure all elements get plenty of time directly under the flames. The majority of carne asada recipes will require marinating the meat for at least a few hours, if not overnight. Marinating your meat not only imparts incredible flavor but also ensures your meat is juicy and fork tender. However, when you need to get a tasty dinner on the table and don’t have time for a lengthy marinating process, that doesn’t mean that you should have to settle for less than stellar flavor or tough meat. With this sheet-pan carne asada recipe, you don’t have to worry about either. 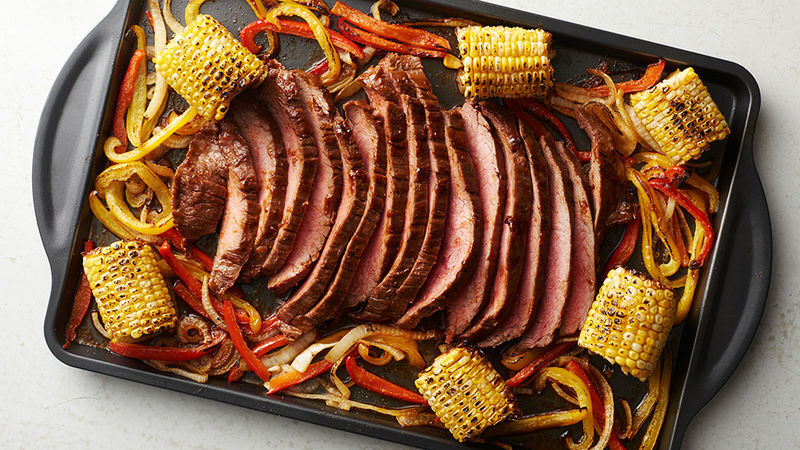 Fresh vegetables are tossed with aromatic cumin and slightly lemon-y coriander while thinly sliced steak gets a rub of zesty taco seasoning and spicy red pepper. We’d like to tell you that beef recipes don’t get any more tender or flavorful than this. However, these beef recipes prove otherwise.